This week, Jean-François Decaux, Co-Chief Executive Officer, JCDecaux and Graeme Craig, Commercial Development Director, Transport for London (TfL), celebrated the 500th digital screen installation on the prestigious TfL bus shelter network. The digital transformation of TfL’s bus shelter network is a core element of JCDecaux’s vision to make London the global showcase for digital Out-of-Home. A key part of the roll-out was the total digitisation of Oxford Street, with its digital screens synchronised last year to dramatically increase the impact and noticeability of the Oxford Street network. The Luxury network extends across the Royal Borough of Kensington and Chelsea, Kings Road, Knightsbridge, Hyde Park Corner, High Street Kensington and Park Lane. 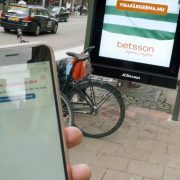 This new channel of communication for London has increased the vibrancy of bus shelter advertising to the benefit of both advertisers and passengers with new dynamic capabilities and increased screen quality. 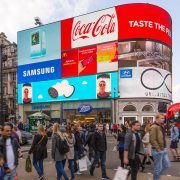 A new data centric strategy has been enabled through JCDecaux’s SmartBrics planning platform and its Smart Content management system driving a new era of contextual, topical and socially integrated campaigns across London.